What would you do with an extra $200? AT&T is giving customers the gift of savings this year with a super deal on electronics! Save $200 on Microsoft Surface 3 when bundled with any smartphone on AT&T Next! Yep, any smartphone! 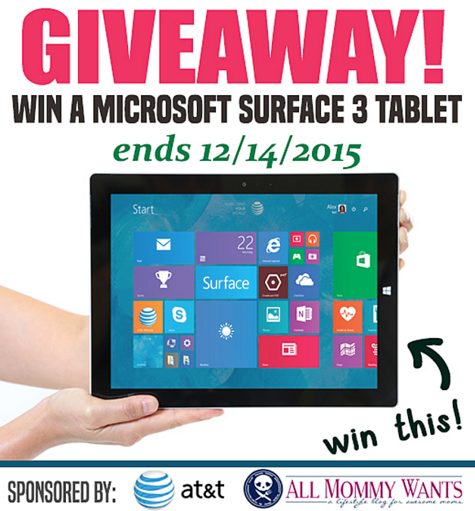 Check out more about the Microsoft Surface 3 at All Mommy Wants! Microsoft Surface 3 is the tablet that can replace your laptop. 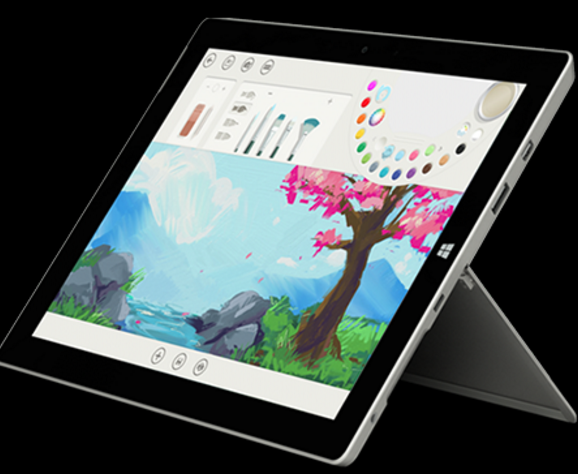 With the integrated Kickstand, the ability to run desktop software and touch apps, and a full-size USB port, Surface 3 is a perfect mix of innovation and practicality. As thin and light as it is, you’ll be amazed at all you can achieve with this device. The bundle with all smartphones is going through the holidays (until 1/7) and the final price with 200.00 off is $399.99. Pretty fantastic if you ask me! To celebrate this HUGE promotion I have partnered with All Mommy Wants and other amazing blogs to give one reader a brand new Microsoft Surface 3 LTE Tablet PC! Will you keep it for yourself or give it as a gift? The choice is yours! Enter below, ends 11:59pm PST on 12/14/2015. US only, 18 and older. Fine print: Contest open **US** ages 18 and over. Winner has 48 hours to respond to my email – make sure to check your spam and whitelist email carol@allmommywants.com. Failure to respond will cause winner to forfeit the prize and a new winner will be chosen. Please note that prize can take up to 6 weeks to be received by the sponsor. No Purchase Necessary to enter. This giveaway is in no way affiliated with Facebook, Pinterest, Youtube or Twitter. One entrant per household/IP address.